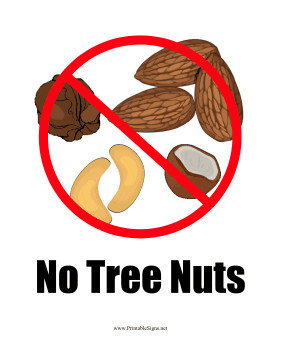 This printable sign is for people who are allergic to all nuts, not just peanuts. It shows a walnut, cashews, almonds, and coconuts to indicate that there are no tree nuts in a dish or in the kitchen where it was prepared. It should be exhibited in schools, cafeterias, restaurants or anywhere a person with a nut allergy might eat.